On November 9, 2015, the Sri Lankan Law and Order Minister, Tilak Marapana, resigned, after some influential fellow ministers vehemently opposed his decision not to pursue a high profile case against Avant Garde Maritime Services Ltd., (AGMSL), a controversial company which maintains a floating armory and supplies weapons and Sea Marshals to vessels plying in pirate infested areas of the Indian Ocean. India had raised the issue of floating armories in the Indian Ocean region at the recent annual Sri Lanka-India Defense Dialogue in New Delhi. As per the minutes of the meeting, the Indian Defense Secretary highlighted India’s concern over the existence of a large number of Private Maritime Security Companies (PMSCs) to counter piracy. He said that in the absence of a regulatory mechanism, unlawful use of these armories cannot be ruled out. The Lankan Defense Secretary said that his government is reviewing the existing regulations and assured that India’s concerns will be adequately addressed. India has had a couple of bad experiences with foreign Sea Marshals. The killing of two Kerala fishermen by Italian Marines guarding a commercial vessel had triggered a diplomatic row between India and Italy. This new and highly profitable business for PMSCs is uncontrolled and almost entirely unregulated, posing additional legal and security challenges for all parties involved. It is over three years and yet there exists no international regulation and but only limited national regulation. As the floating armories are often moored in international waters, they operate in a ‘legal grey area’ with, in some cases, the only regulation coming from the states that register the vessels (the flag states). There are at least 3 states (Djibouti, Mongolia, and St Kitts and Grenadine) that give explicit approval for vessels to operate as floating armories. Other states do have some regulation regarding the carrying of weapons on board ships but it mainly relates to PMSCs rather than floating armories specifically. Hereby, we are enclosing an abridged report on the so called unregulated "Floating Armories", provided by one of the leading security consulting and research organizations from UK. For more detail, check the footnote after the reading. Floating armories are vessels used to store weapons, ammunition, and related equipment such as body armor and night vision goggles. They also provide other logistics support including accommodation, food and medical supplies storage for Private Maritime Security Companies (PMSCs) engaged in vessel protection. They are typically commercially owned vessels, often anchored in international waters. The term “logistic support vessel” is sometimes used by the industry when referring to floating armories. However as the primary function of these vessels is to facilitate the storage and provision of weapons we believe the term floating armories is more appropriate. Floating armories are not purpose built vessels but ships that have been converted and retrofitted. The armories include ships that were previously offshore tugs, anchor handlers, research vessels, patrol boats and a roll on-roll off ferry. For example, the MV Sea Patrol currently used as a floating armory was originally a navy de-mining ship and there is an advertisement for the sale of a ship that was recently used for hydro-graphic and survey activities but which it would be “ideal” as an armory. There is no requirement for floating armories to have standardized secure storage such as strong rooms in the hull of the ship. One company may own and/or run several floating armories as well as other storage facilities. The company concerned, Avant Garde Maritime Services, runs a range of storage facilities and rents weapons, ammunition and body armor to private security contractors. It currently operates 3 floating armories, strategically placed in 3 key locations around the High Risk Area (HRA) .These provide storage facility of firearms owned by both PMSCs and the government of Sri Lanka as well as accommodation for sea Marshals. Avant Garde’s floating armories are currently located in the Gulf of Oman off the coast of Fujairah, in the Red Sea and in Galle off of the coast of Sri Lanka.Weapons and other equipment may be embarked or disembarked at any of the armories. The company also has facilities for weapons storage on the routes shown on the map (below) and also offers a range of additional services including sea marshals and training on the use of weapons. Weapons and ammunition may be rented from official stocks of the Government of Sri Lanka or operators may use the facilities to store their own weapons. Avant Garde Maritime Services (PVT) Ltd who operate 3 armories on the authorization of the Sri Lankan Government; MV Mahanuwara off the coast of Sri Lanka, MV Sinbad in the Gulf of Oman (along with Sinbad Navigation) and the MV Avant Garde in the Red Sea . Sinbad Navigation also appears to run its own floating armory, MV Antarctica Dream, in the Red Sea. The Government of Djibouti has authorized Sovereign Global UK to operate 2 floating armories; the MV Aladin in the Gulf of Oman and the MV Sultan in the Red Sea. MNG Maritime operates 2 floating armories: MV MNG Resolution and the MV Sea Patrol. Drum Cussac have a UK license to operate floating armories, they reportedly operate an armory on the MV Sea Lion. In addition the American company AdvanFort operates a floating armory aboard MV Seaman Guard Ohio – which is currently impounded by the Indian authorities. The main concentration of the armories is in the Red Sea, Gulf of Oman and the Indian Ocean. The current security situation in the Gulf of Oman and the Indian Ocean makes this the current focal point for armories but this may change, especially in relation to the increase in the number of attacks on shipping off the west coast of Africa and in South East Asia. Floating armories are located at either end of the piracy affected zone, allowing operators to both pick up and drop off weapons outside the HRA and also out of territorial jurisdiction. A central registry system must be established, listing the names and registration numbers (IMO number) of the floating armories as well as other pertinent information such as flag state and operator. In the case of a PMSC or armory operator going into administrative process, there should be a mechanism in place to ensure that any weapons and ammunition are securely stored and subsequently destroyed. Standards governing floating armories should be introduced by Flag States. We recommend that floating armories are flagged to an appropriate state. Governments who have given permission for PMSCs to use floating armories immediately revoke permission for the PMSCs to store weapons on armories flagged to either Paris MOU or Tokyo MOU black listed countries. An interim measure should be deployed at all operators of floating armories regarding the in receipt of ISO 28000 and ISO/PAS 28007 certification. Strict regulations relating to record keeping must be developed and enforced and any transgression of the regulations is investigated and perpetrators prosecuted. The IMO or other international body must establish a regulatory authority to regulate, monitor and inspect floating armories and the activities of their operators. Insurance companies should seek mandatory declarations from vessel owners and request proof from PMSCs that they are not using unlicensed floating armories to store their weapons and they hold the correct licenses for any weapons they possess. Any international register of floating armories must contain the information detailing the insurer of the vessel. The country that is licensing the arms transfer should develop a certification process to ensure that PMSCs have the necessary documentation to use and carry arms and ammunition. Any international register of floating armories must contain the information on the number of weapons and quantity of ammunition permitted to be stored on board. There is no doubt that the deployment of armed guards on board merchant vessels has led to a significant reduction in the number of ships that have been hijacked. In addition the growth in floating armories has enabled countries to reduce the use of land-based armories by PMSCs, and has enabled PMSCs personnel to access the required logistical support and equipment that they need to function effectively. However, there is a worrying lack of regulation regarding the operation and use of floating armories. There needs to be coordinated international action, something that has to date been lacking, resulting in piecemeal and disjointed government responses. The current situation where some armories are registered in their home country, registered voluntarily with the IMO and/or SAMI and adhere to the (voluntary) ISO standards whilst others do not, is insufficient to deal with the issues raised by the proliferation of floating armories. There is nothing to prevent any vessel being turned into an armory in international waters, and if the flag state is a country with limited (or no) controls over the storing and transfer of military equipment then such vessels may operate with no oversight what-so-ever. 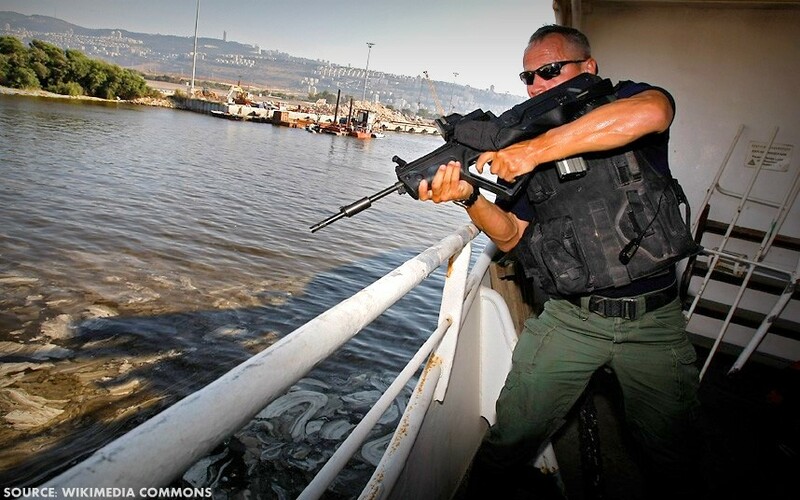 Such vessels allow companies whose operators may not be licensed to use or transfer weapons and ammunition, to act with impunity. The growth of floating armories and lack of oversight for such vessels is a worrying development. A further issue is the lack of transparency over the number of weapons and quantity of ammunition that may be stored or moved between them. There is an urgent need for international agreement between states on a minimum set of standards for such armories. Flag states, where such vessels are registered, should incorporate a ‘benchmark’ set of requirements over storage, security and record keeping for weapons on board vessels that all operators should be required to meet. Given the range of companies operating in the PMSC sector, the complex jurisdictional issues relating to company registration and the large quantities of small arms and light weapons licensed for use by such companies, targeting the armories themselves, and the states under whose flag they sail seems to be the most expedient way of ensuring that some type of oversight is exercised in the short term. The rise of such a significant number of PMSCs and the persistent threat to commercial shipping means that floating armories are likely to continue to be a feature of the modern response to maritime security threats. Whilst such vessels may have originally been deployed to the Indian Ocean, their mobility means that they are easily re-deployable around the globe. An international response is required from the International Maritime Organisation, or another body, with the task of monitoring all floating armories and the companies that operate and use them. The Omega Research Foundation is an independent UK-based research organization. They are dedicated to providing rigorous, objective, evidence-based research on the manufacture, trade in, and use of, military, security and police (MSP) technologies. The company information detailed in this report is for illustrative purposes only and drawn from information already in the public domain. The authors as well as the original publishers do not intend to imply that any companies named in this report have committed any wrongdoing nor behaved in an improper manner.